Farmhouse industrial barn light bronze 1-light outdoor wall light with bronze warehouse shade. Takes one 100-watt medium base frosted light bulb (not included). 120 volts line voltage. ETL / CETL certified. Rated for installation in wet, damp, dry locations. Recesso Lighting began with a simple idea,reuse dated recessed lights by adding beautiful, decorative shades. Literally billions of old recessed lights are installed in buildings around the world today. Tossing them in the landfill is not the solution. 18.875 in x 12 in x 17.875 in. 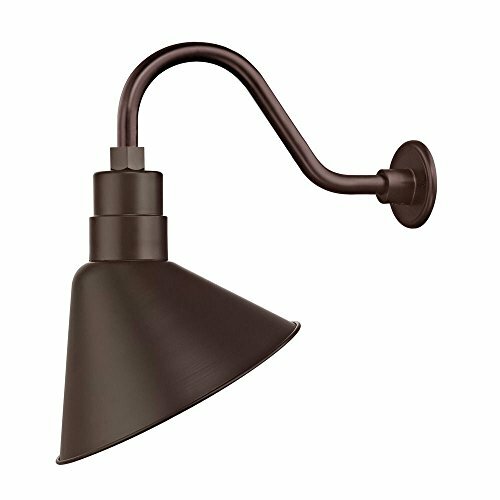 Recesso Lighting By Dolan Designs Bronze Gooseneck Barn Light w/ Scoop Shade - Aluminum Outdoor Wall Fixture - 18.875 in X 12 in X 17.875 In. Height: 18.875 in. Width: 12 in. Depth: 17.875 in. View More In Vanity Lights. If you have any questions about this product by Dolan Designs, contact us by completing and submitting the form below. If you are looking for a specif part number, please include it with your message. Yosemite Home Decor F051B02EB Isabella Two Light Bath Vanity with Spanish Scalloped Glass Shades in Earthen Bronze Finish, 16.5" x 14.25"
© 2019 - versolaquila.com. All Rights Reserved.